Cheeky Monkey is a push-your-luck, draw-till-you-bust kind of game, in which “bust” means drawing two of the same kinds of animal from a bag. The odds for each kind of animal are given on the board, and if you pay attention to what others have collected and apply some probability savvy, you can do well despite the element of luck. It’s also possible to “steal” previously drawn animals from other players, so there’s a bit of strategy in how you stack up your successfully drawn animals, to avoid others taking them. Fun, fast-paced, and easy to learn. Beowulf: The Legend is a competitive bidding game, in which you “accompany” Beowulf in his adventures, fight in his battles, and receive “scratches” or the even worse “wounds” if the encounters do not go well. You aren’t directly fighting the other players (in fact the game scenario is that you’re all traveling together) but in several rounds, there are bad effects (like wounds) that have to be divvied up to one of the party, and the weakest one will lose. Rather bloodier than most games I’ve played, but intriguing. Pillars of the Earth was my favorite. It’s a resource/building game, which I tend to like, and it has a gorgeous (rather complicated) board set in olde England, in which you seek to build a cathedral. The cathedral itself doesn’t really factor into the game; it’s more about building, buying, and selling the wood, stone, and sand resources needed for the castle. But there are enough wrinkles to keep this from being more than just a production/selling game, mainly provided by your three “master builders” that let you snap up special bonuses or avoid taxes; you compete with other players for their placement. That’s about it in terms of direct contact with other players (no trading), but it helps to keep an eye on what their current collection of craftsmen reveals about their current strategy, so that you can thwart it. Great fun! 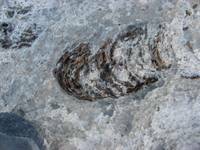 The Alamo Breccia: Was it an Impact? The second day of our Geology 601 field trip led us to the (in)famous Alamo Breccia. A breccia is a rock that contains a bunch of other angular pieces of rock, all jumbled together, and generally forms after something breaks up the original rock and then cements the rubble together. The Alamo Breccia is notable because several researchers have hypothesized that it was created by a massive meteor impact. So out we went in the early, crisp (31 degrees F) Nevada morning to see if we could find the evidence that pointed to this interpretation. We started by clambering up to the exposed rock face shown in the top image. And we did find breccia — lots of it (see right)! 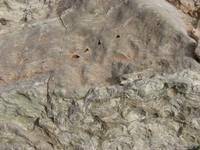 Some types of evidence for a possible impact were not things we could observe at the outcrop. One such “smoking gun” would be the presence of “shocked” quartz grains, which are grains with many parallel fractures, which could be created by an impact shock wave. This requires a microscope to confirm. Another way that we identify past impacts is by the presence of anomalously high levels of iridium. Iridium is rare in terrestrial rocks, but much more common in meteorites; if one impacted, its debris would leave an iridium signature in the surrounding area. This has been tested in this region, but so far only very low levels of iridium have been observed. 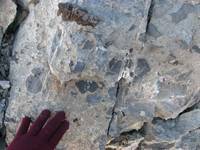 However, the researchers in favor of an impact-related explanation for the breccia have also claimed to have found impact-created lapilli, which are little spherical beads of rock that was liquefied and then cooled by the impact. We think we found these (sorry, no picture). 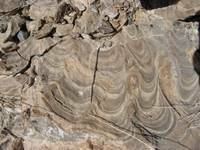 At our next stop, we found a hydrothermal vein where entirely abiotic stromatolites had formed. See the resemblance, in structure if not color? In this case, no life was involved. We know this because we have petrographic thin sections of this rock, and under the microscope you can see that they’re composed entirely of crystal growth (not bacterial layers). Still, this was another fun collecting frenzy (this is a very important specimen). 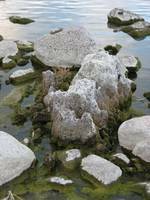 After lunch, we drove west across Nevada to Hawthorne, and sunset found us at Walker Lake, where abiotic tufa (see left) and carbonate stromatolites are found in abundance. We all stood around and watched while another grad student hacked off pieces of stromatolite for her dissertation research, placing each piece in a sample bag. It was another fabulous, full day, and I could barely keep my eyes open through dinner. One more day to go! 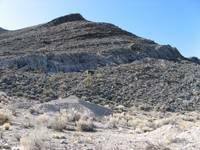 Our Geology 601 field trip this spring took us into the wilds of Nevada. 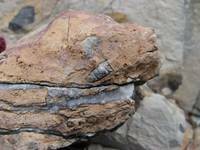 The class, called “Crises in Earth History”, examines past mass extinctions and the evidence for such in the rock record. 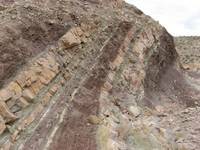 Nevada contains some great field sites associated with these events. Our first day focused on the Permian-Triassic boundary. While the P-T boundary itself is not visible in the southwestern U.S. (due to a lack of deposition at the time or a later erosional event), we were able to visit the late Permian in Arrow Canyon and the early Triassic in the Muddy Mountains. This was a fantastic experience! 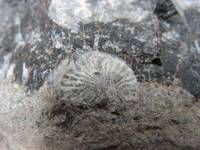 I’ve never gone fossil hunting before, so I didn’t know what to expect. I also haven’t taken any paleobiology classes, so I didn’t have the expertise needed to identify the fossils myself. But luckily, I was out there with several other grad students and professors with exactly that knowledge. We saw the broken-up arms of crinoids (at right), radial corals (below left), and even fossilized tree roots (below right). We hiked further into the canyon, which flourished with present-day life as well (notably, lots of gorgeous barrel cacti). I found an interesting specimen that turned out to be (in the best guess of the assembled professoriate) bladed gypsum crystals. As usual, the line between biotic and abiotic isn’t always obvious. However, even this abiotic find excited interest in the group because of the implications for the local environment (gypsum tends to form in shallow marine waters). We had lunch in a fabulous slot canyon that felt like it came right out of a Tolkien book, with towering rock walls only 20 feet apart, a fringe of bright green grass along the base of both sides, and the canyon itself leading off into mysterious twists that practically demanded further investigation. However, time was limited and we headed off to our next stop. At the Muddy Mountains, we got to observe the early Triassic. A recent flash flood had wiped out part of the road and cut into the surrounding hills to provide us with a remarkable glimpse into newly exposed beds. We found an incredible shell bed, where the fossils (bivalves) were literally just falling out of the rock (see image at right, lower layer). 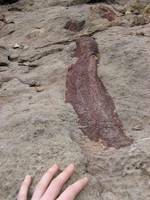 Across the road, early Triassic “red beds” (shale) were in evidence, alternating with carbonates (pale layers). This has been taken as evidence of fluctuating (local) sea levels, as red-beds are generally believed to have formed above water and carbonates below it. However, if you look closer, you can also see thin green shale layers between the carbonate and the red beds — on both sides of the carbonate, in fact. The green color, instead of red, could indicate that it was formed in anoxic (low or no oxygen) conditions, but this is unlikely to happen above water, and even in the water usually would only happen in very deep water, while the carbonates form in shallow water. We were all standing around scratching our heads, and someone suggested that the green shale could be an alteration of the red shale, caused by contact with the carbonate. This looks plausible visually: I noted that the green layers were thicker where the carbonate layers were thicker, as if the thicker carbonate could affect more of its surroundings. On the other hand, no one could come up with a chemical reaction that the carbonate would induce on the shale to reverse its oxidation. We moved further up the road, and turned the corner to find the real jackpot. 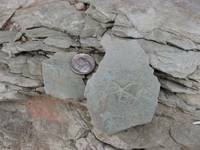 Trace fossils are fossil structures that record not the body of a organism but marks it made while burrowing or crawling or otherwise disturbing soft sediment. We were told that this particular outcrop had, somewhere in it, the trace fossil asteriacites, a star-shaped imprint where a starfish-like creature rested. Immediately, we all tackled the outcrop with enthusiasm, sorting through bits of rock to find these centimeter-scale fossils. The sedate meandering observational pace transformed into an Easter-egg hunt or garage-scale atmosphere, and just minutes later the first find was declared. At left is one I went home with. Whee! Descending back to the road, I almost stepped on a bit of present-day life. 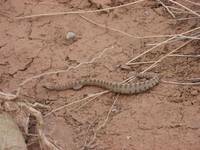 I hesitated mid-step when the ground below me seemed to shimmer, then realized that it was occupied by a baby rattlesnake (about one foot long). It was the first rattlesnake I’d ever seen, and I was eagerly zooming in for pictures, when another student suggested that I back away because, after all, they are venomous, and apparently (she said) the baby ones are actually more dangerous than adults because they have no control over how much poison they inject, so they just shoot you full of everything they’ve got. I backed away regretfully (I was fascinated by the evidence of its last meal) but did get a few photos! Overall, the extinction associated with this boundary is believed to have been the biggest in Earth’s history, with up to 96% of marine species going extinct. And indeed, we observed that Arrow Canyon’s fossils showed much more diversity than those in the Muddy Mountains (although I was surprised to see so many Triassic fossils — this section must have been a good bit after the actual boundary). An excellent start to the field trip! I’m curious about these observations. I’m sure that the scientists involved have already applied an appropriately sized dose of skepticism to this subsurface ocean theory, but my gut reaction would be that an error in measurement is far more likely than a decoupled crust and core separated by a liquid ocean (where are you, Mr. Occam?). (In fact, if the displacements really are “systematic” then a measurement bias/error is an even more likely candidate explanation.) I’ll have to look for the upcoming article in Science! I am planning a trip to Japan in May, and right now I’m working on finding places to stay for a few nights in Tokyo. It’s Japan, so naturally I want to stay in a ryokan to get the full experience. I browse the various ryokan websites and check review sites to get other travelers’ impressions. And then — lo and behold — in walks Youtube. You can search for a ryokan’s name and get videos people have posted from their stays, e.g., this video walkthrough of a room at Hotel Edoya (a ryokan, despite the name). It’s fascinating and yet somehow eerie to be able to preview the rooms in this informal way (perhaps made more eerie by the guy behind the camera getting a shot of his shirtless self in the bathroom mirror). The other ultra-cool thing about trip planning, at least with respect to Japan, is Google Maps. I requested directions from Tokyo to Kyoto just to get a sense of how far apart they were. Instead of driving directions, maps.google.com gave me train directions. What does that say about cultural assumptions? I was blown away by how cool this integration is. It shows you four alternate trips, starting with the next departure time, and lists each train you need to take, how much time between connections, and how far you’ll need to walk (if at all). You can also give it future departure times to plan ahead. Why can’t we have this for the U.S.? I’d love it if the LA Metro schedule were integrated into Google Maps. You get all of the beautiful google zooming and panning, topography and satellite images, and you can (for example) follow your planned path and see just how close the train gets to Mt. Fuji. Totally awesome.